Gibraltar Airport is a international hub that sees over half a million passengers arrive each year. This tiny peninsula situated at the most southernly part of mainland Spain but governed by the UK. Due to the short distance many visitors to the Costa del Sol use our Gibraltar Airport Transfers to reach the likes of Marbella and Puerto Banus. Why choose Simply Shuttles for your Gibraltar Airport Transfers? 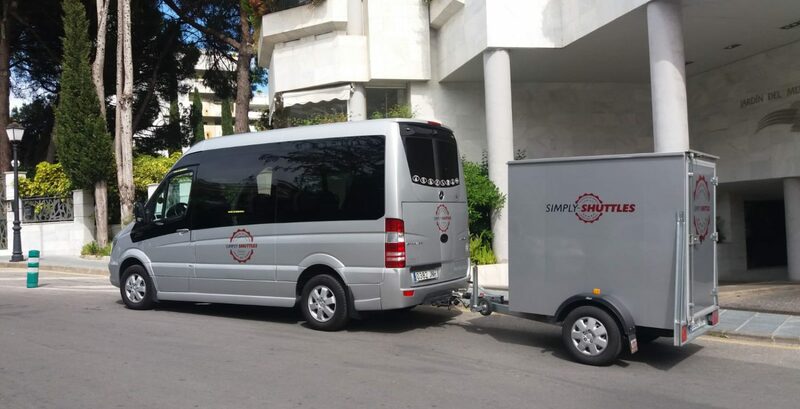 Simply Shuttles have been offering high quality transfer services in and around the Costa del Sol since 2011. Our team is passionate about customer care, going above and beyond to deliver the best possible service. Our 5 star reviews on Trustpilot and TripAdvisor are testament to the quality of our airport transfers. If you’re flying into Gibraltar Airport, look no further than Simply Shuttles for your airport transfer. Simply fill in the form at the top of this page and book your transfer today! Gibraltar Airport is modern and spacious and very quiet compared to Malaga. There are very few queues and delays and you can easily move through the airport with the minimum of inconvenience. It is a small airport, but has everything you need and if you’re holidaying in Sotogrande, Duquesa or Estepona it can be a very convenient choice. Whether you’re heading to your apartment, villa or hotel, it’s always better to arrive cool, calm and collected. That’s where Simply Shuttles comes in! Gibraltar Airport is an excellent choice for the western Costa del Sol, the Cadiz province and the stunning beaches along the Costa de la Luz. Simply Shuttles can take you wherever you need to go from Gibraltar Airport, but here are some of the most popular destinations. · Duquesa and Manilva – This is a very popular area for holiday makers, with a lovely combination of Spanish charm, beautiful beaches and pretty countryside and a busy port area with great nightlife. It’s 35 kilometres from Gibraltar Airport. · Estepona – A vibrant Spanish town with plenty to offer, Estepona is growing in popularity with holidaymakers. It combines lovely beaches, with great restaurants, a charming Old Town and lots to do. Estepona is 48 kilometres from Gibraltar Airport. · Sotogrande – A stunning marina, excellent golf courses and polo a plenty makes Sotogrande a very exclusive and desirable destination. It is within easy reach of Gibraltar Airport, just 26 kilometres away. Our Gibraltar Airport transfer service is the first choice for visitors who want to travel to their next destination in comfort. Upon your arrival at Gibraltar Airport, simply cross the border into Spain to meet your dedicated driver. As you pass through the border control building, your friendly driver will be waiting to greet you directly outside the building with one of our vehicles and a sign with your name on it. It’s a simple and fast process and a stress free way to start your trip. And at the end of your visit, let Simply Shuttles take you back to Gibraltar Airport in plenty of time to catch your flight home. If you’re looking for a reliable and professional transfer service from Gibraltar Airport, book online now with Simply Shuttles. Get a price and book your Gibraltar Airport transfers by completing the Quote/Booking form at the top of the page. Upon making a reservation, we’ll send you a booking confirmation. The confirmation will confirm all your booking details and other relevant travel information. If you’re flying into Gibraltar, count on Simply Shuttles to collect you and bring you to your destination in style. Whether you’re flying to Gibraltar for business or pleasure, a Gibraltar Airport transfer is the perfect way to start your trip! Discover more of what the Costa del Sol and Andalucia have to offer. Our fleet of luxury vehicles for any occasion.